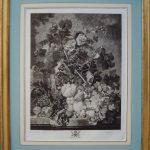 A superb pair of botanical prints engraved by one of finest mezzotint artists of the 18th century! Two of the finest decorative botanical pictures that were ever published in Britain, and form part of the images reproduced from the collection belonging to the Earl of Orford in Norfolk. 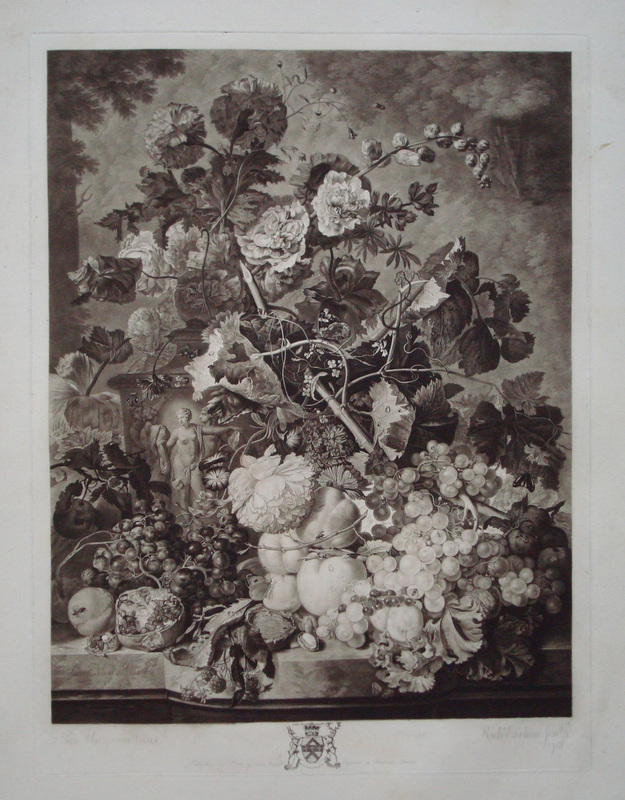 In A Fruit Piece and its pendant A Flower Piece, Earlom skilfully combined the techniques of etching and mezzotint to convey Van Huysum’s highly detailed, colourful painting into a black and white printed medium. 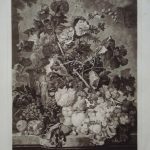 The engraver first created fine etched lines to give definition to the delicate forms, and with the use of stippling conveyed areas of gentle shading, before starting work on the mezzotint tone to more fully render the effect of light, shade and an array of different surface textures. 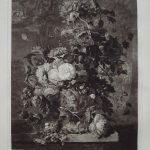 Mezzotint – is a technique where the engraver works from dark to light. The plate is completely covered with masses of tiny indentations using a multi-toothed device called a rocker. When inked, the plate would print a uniform dense black. Lighter areas are then “scraped” by burnishing the plate in varying degrees so that less ink is caught by the smoother surface. The technique was ideal for rendering the tones of oil painting and as such was used mainly for the reproductions of portraits as well as genre and decorative subjects. It gave a rich velvety texture, unequalled by any other technique. Richard Earlom (1743-1822) was one of the leading British mezzotint engravers of his time, though he also produced some etchings and plates in the chalk style of portraits, landscapes, botanical and decorative subjects after his contemporaries and Old Masters. Born in London he was apprenticed to G.B. Cipriani and then worked for John Boydell from about 1765, his best known production for Boydell being the Liber Veritas, 200 plates after landscape drawings by Claude Lorraine. 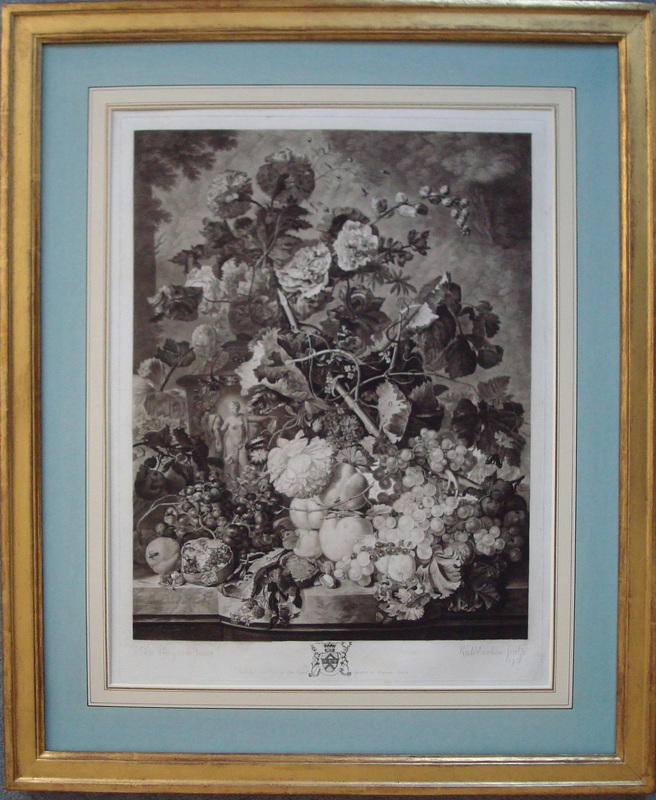 He also engraved prints and portraits after Rembrandt, Poussin, Guercino and Rubens. Other major works include flowers images for Robert John Thornton famous Temple of Flora series published from 1799-1807. John Boydell’s stature as the leading publisher in London was secured on his near monopoly of the publication of Old Master paintings in English collections. His most ambitious publishing project being his reproduction of the paintings in the collection of the Earl of Orford at Houghton Hall in Norfolk, called the ‘first collection in Europe’. The plates for The Houghton Gallery were executed throughout the period 1774 to 1788. This large-scale initiative was spurred on by the increasing likelihood that the family would need to sell the pictures to pay off large debts. The sale eventually took place in 1779, purchased for an unknown amount by Empress Catherine the Great of Russia (1729-1796) for the new Hermitage gallery in St Petersburg. 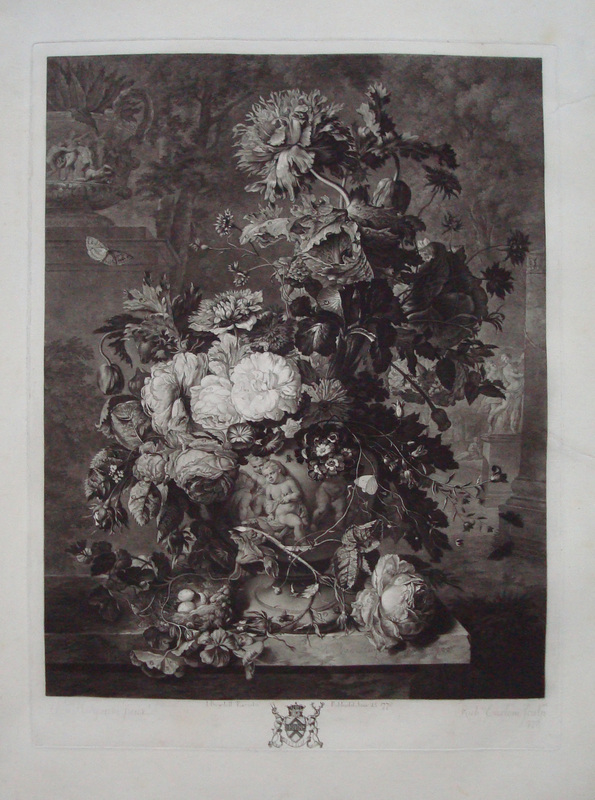 Jan van Huysum (1682-1749) the Old Master artist, called by his contemporaries ‘the phoenix of all flower painters’. 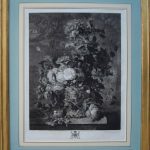 Dutch eighteenth century flower painting can be as the age of Van Huysum, and in his lifetime the Kings of Poland and Prussia, the Elector of Saxony, Prince William of Hesse, the Dukes of Orleans and Mecklenburg, and Sir Robert Walpole were eager patrons. 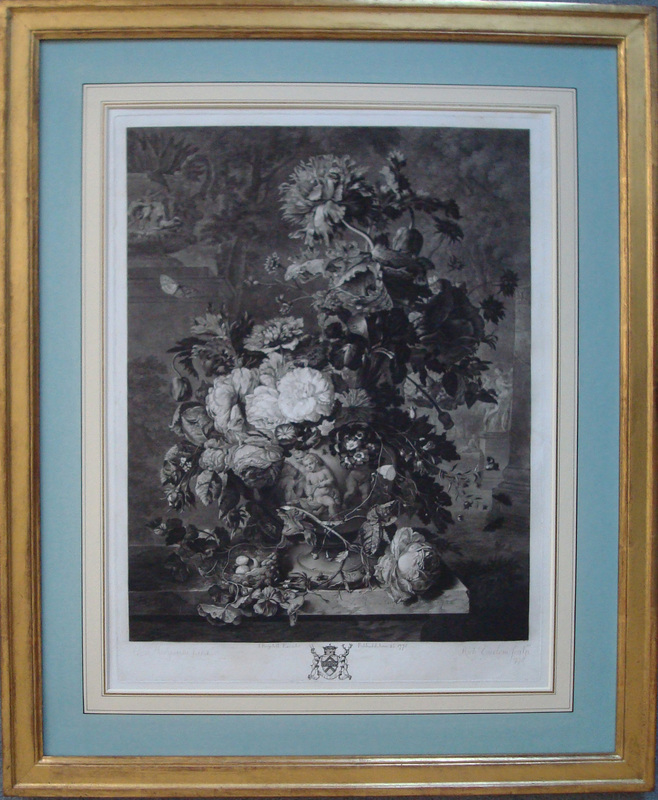 Born in Amsterdam, a city which he appears never to have left, from his marriage in 1704 until his death in 1749 he remained independent of his family, many members of which were also painters of flower pieces. He jealously guarded his success, working in strict privacy in order that none might see the preparation of neither his pigments nor how he worked. He is said to have drawn from the real flower and gone to Haarlem each summer to study specimens. His dedication to his art led him to possess an unerring elegance of composition with curvaceous swirls of line that make the viewer’s eye dance across the painting. For Van Huysum decoration was the key.